I mentioned in part 1 of this series that salvation itself is a Trinitarian motion: God the Father reaching out to creation with his two hands, Jesus, the Son, and the Holy Spirit. I compared it there to hug, the Father spreading his arms wide in the Son and the Spirit, pulling us close in his embrace. Or, as one theologian put it, "It is by these two hands that God gives himself to us in love to bring us to intimate communion." In this final post, I want to delve a little deeper into this idea. What does the Trinity really have to do with salvation? In a nutshell, the Trinity has everything to do with salvation. The particular roles of each of the three persons and their union as one God are both essential to understanding the scriptures' claims about God's redemptive work. For starters, John's gospel repeats over and over that Jesus is sent by the Father (for instance, see 6:38-40, 57; 8:15-18; 20:21). The Father is the initiator in God's redemptive acts in the world. 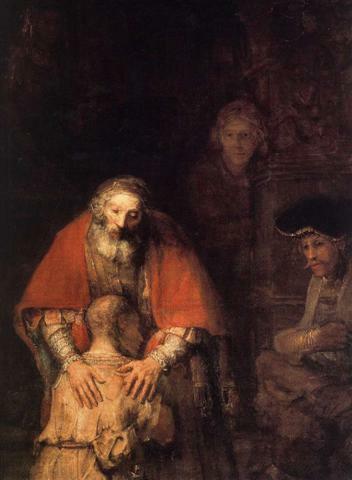 Yet the Father accomplishes all of this with his 'two hands': the Son and the Holy Spirit. There are so many ways to talk about Jesus' role in salvation. One way to describe Jesus' work is to say that in him humanity has been restored to the image of God--the image that has been tarnished by death ever since the Fall. Jesus accomplishes this because, while he is a man, he is also "the image of the invisible God" (Col 1:15), and in him we have a human being who is whole, perfectly reflecting the image of God as we were created to do (Gen 1:26-27). But how does this affect you and me? Just because Jesus has attained, in the Resurrection, a human life that is above the murderous power of sin, that doesn't necessarily mean anything changes for us, right? Many people jump over this point, I think, or they see Jesus primarily as a sort of divine whipping boy and avoid this problem entirely. The key is that Jesus' life and Jesus' victory are connected to us by the Holy Spirit (the "Spirit of Jesus Christ," Phil 1:19). Paul is always using the phrase "in Christ": 'if anyone is in Christ, he is a new creation'; 'there is no condemnation for those who are in Christ'; 'there is neither Jew nor Greek, slave nor free... you are all one in Christ'; 'the dead in Christ shall rise'--I could go on. We are made to be "in Christ," united to Christ and to the redemptive, resurrection life that he has, by the Holy Spirit. "If the Spirit of him who raised Jesus from the dead is living in you, he who raised Christ from the dead will also give life to your mortal bodies through his Spirit, who lives in you" (Rom 8:11). Because the Holy Spirit is God, by living in us he fills us with the life of God--the same life that conquered the powers of sin and death through God the Son on Easter morning. It's only because of the Triune nature of God, the unity of the Father, the Son, and the Holy Spirit as one God, that any of this makes sense. My point in all of this? Unless you want to think of salvation simply as a matter of averting God's wrath, with Jesus merely taking the blame and the punishment in our place, then the biblical picture of God's saving work falls apart without belief in the Trinity. This doctrine that so many frequently brush off as, at best, unimportant and irrelevant, at worst, ancient Greek philosophical mumbo-jumbo masquerading as authentic Christian belief, this doctrine is a bedrock to our faith. It matters. Maybe next year, come Trinity Sunday (though I hope it won't take our preachers that long to work up the nerve to speak of the Trinity again), we can approach this holy mystery with reverence and even excitement, eager to see what our Three-in-One God would show us and how this beautiful vision of the life of God can pour some new life into us. In three blog posts I can't say much about the holy Trinity. There is nearly two-thousand years of wisdom, captured in pages and pages of books and sermons and prayers, hard earned through untold hours of wrestling and reflection, before us. All I can do is select particular issues and limit myself to a few things about which I hope I have a helpful word to share. That being said, as we pick this series back up, I want to think this week about one practical implication of the Christian belief that God is Trinity. The doctrine of the Trinity depicts the life of God as, above all else, relational. God is a community of persons, the Father, the Son, and the Holy Spirit, who live in union as one God. That's what the icon of the Trinity above is trying to illustrate, using the story of Genesis 18, where the Lord appears to Abraham through three visitors. Of course this strong emphasis on the 'three' in "three-in-one" can be taken too far. We believe in one God, not three gods. But it is a God who lives as a communion of three persons. To repeat an analogy from last time, God's life is like a dynamic dance with three partners, a fusion of movements and relationships interacting and coming together to form something beautiful. Relationship is at the core of who our God is. Now, if human beings are made in the image of God (Gen 1:27-28), then our lives ought to be images of God's life, to mirror the kind of intimate relationships that are at the heart of the life of God. One theologian draws all of this together clearly when he writes that Christians need a new definition of the word "person." We need to understand that a person is not just an individual but "someone who finds his or her true being in communion with God and with others... The human person is someone who finds his or her true being in relation, in love, in communion. "* We are all designed for loving relationships with God and our neighbor. For the Christian who believes in the Trinity and believes that human beings are made in the image of God, this is what it means to be a person! Any other definition, anything that leaves out this picture and tries to frame our identities simply in terms of individual liberties or self-fulfillment or whatever else, is not a Christian definition. Now remember, Nance, you said this was practical. And it is! This theologian goes on in the following pages to apply this definition of "person" to our understanding of marriage. For many people, he suggests, marriage is a legal contract between two individuals who are looking for personal fulfillment, to realize their potential, and to meet their own deep needs. Too often, when someone's partner can't satisfy these enormous demands, the relationship disintegrates--they're just getting in the way of the other's dreams and happiness. Such a relationship can't be sustained because it lacks the mutual self-giving, the deep, intimate communion we are designed for, the kind of loving relations we see in the Trinity. If we come to marriage with different expectations of ourselves, that we aren't meant for personal fulfillment but for relationship and communion with others and with God, then a different sort of union takes place. It's a union where I have no grounds for asserting myself and my hopes or needs over against my wife. Those aren't the goals we're aiming at anymore. We are created in the image of the Three-in-One God, and our true fulfillment looks like the self-sacrifice and faithfulness that marriage demands. Maybe this doctrine isn't so impractical after all. Next week we'll wrap up with "what is the Trinity and why does it matter? pt. 3." * This quotation is from James Torrance's fantastic but difficult little book, Worship, Community, and the Triune God of Grace, pp 38-39. Torrance's book is one of the main influences on this series of posts. Those of you who know me well know that my favorite film of all time is James Cameron's Aliens. (Yes, about the monsters that pop out of people's chests. I know.) It is, I think, the perfect blend of science-fiction and action, entertaining every time, yet also well made and featuring solid performances--Sigourney Weaver actually received an Oscar nomination for her role. The movie also stands alone as a sequel that developed yet honored the material of the original 1979 Ridley Scott (Blade Runner, Gladiator) film Alien. The two films are very different: the original is no popcorn action flick. Their strengths are distinctive. Instead of arrogant marines with nukes, guns, knives, and sharp sticks, Alien is full of powerful visuals, impeccable pacing, and, of course, our worst nightmares. And it is from Alien that Ridley Scott's latest film, Prometheus, develops. Not as another sequel to the once respectable franchise, nor as a prequel in the strictest sense, but as a movie sharing, as Scott has remarked, something of the DNA of the original. Prometheus unfolds with the same imaginative character and seemingly in the same future as Alien. In many ways, in fact, it feels like a retelling of Alien, and some very intentional parallels between the film's heroine, Shaw, and Ripley from the original film only reinforce this. Yet Prometheus goes places and raises issues totally foreign to the other films. It deals not only with terrors, but also with questions of meaning and our place in the universe. More specifically, Prometheus asks these questions in a world where human life has suddenly been found to be a result of extraterrestrials' presence on Earth in the distant past (an idea that's pretty popular today, actually, if the New Age section at Barnes and Noble tells you anything). We'll return to this later. Early on, this film recaptures much of what has been forgotten in sci-fi films in recent decades. Space is a world of mystery and discovery again--a spirit the film-makers tapped into, not through the wonders of space exploration but by the puzzles of archaeology and paleontology. This approach allows the world of the film to beckon the viewers on in an unique and potent way. This mystique draws us finally into the dark reality of this universe. We arrive at the reality mid-way through the film, and it is a nightmare. The lines are not straight or crisp; things blur around the edges. You aren't quite sure what is driving this nightmare, besides fear and death and hatred. But this fog overwhelms us suddenly and violently, choking the audience, suffocating us. I actually appreciate the shroud left over most of the film's monsters--any more clarity about their own origins or the fates of those they attacked would have made it too easy to try and understand the horrors and then distance yourself from them. The ambiguity leaves a layer of potential and fear that the viewer cannot easily dismiss. Then there is a respite: we are allowed to emerge out of the other end and return to the foolhardy and futile plotting and intrigues of the characters. But at this point you know not to invest much in their schemes; after the nightmare, their smallness is too apparent. And then we return to the nightmare, and everything, everyone, is quickly consumed by it. And the film ends. Prometheus, in short, is about a quest for answers and origins that only finds chaos and death. As my wife and I talked about the movie afterwards, she complained that while it broached the questions of God, humanity's origins and purpose, it never gave these the attention or time they demanded. The words were spoken, and then the movie went on. I disagree: I think Prometheus is entirely devoted to these questions, but spends much of its time and energy exploring the implications of the 'answers' it offers. Whether humanity has a purposes, whether we were even created on purpose, is not entirely clear. What is clear is that human origins are not a part of something glorious or beautiful, some loving act of conception and nurture. They arise from a chain of events that is disgusting, filled with destruction. Creators that seek to eradicate the works of their hands; creations that embody and intensify the brutalities latent in their creators and finally unleash those things back upon them. Once the literal monsters our progenitors created are known, humanity wonders whether it might not have been better to be the result of chance, without maker, without design. When Shaw, after the worst horrors of the film, retrieves her crucifix and pulls it again around her neck, David asks her, "even after all of that...?" Why would one even hope for a Creator in a universe as frightening and wrong as this one? Much of the film builds up to this question. Many of the visuals are striking--a credit to the original designs by H. R. Giger that carry over from Alien, and the sheer scale of the sets. This is only reinforced by the film's at-times-perfect score. Michael Fassbender's performance as David is excellent, capturing the distance and precision of Lance Hendrickson's android character, Bishop, in Aliens, along with a space for so much more, for growth we never see but could believe. On the whole, the film takes what is not an uncommon trope in science fiction--aliens are responsible for life on Earth--and moves from here into uncomfortable questions about what we are willing to believe about this universe and our place in it, what could possibly possess us to hold on to these beliefs. It's so, so disturbing, yet (especially the first half) completely engrossing. It offers no easy answers to the questions it raises, if any at all, leaving you to wonder. And shudder. Prometheus is rated R for sci-fi violence including some intense images, and brief language. The horrors that are possible in the world of the film are, for the most part, much worse than the actual, on-screen violence. There is one scene in particular, involving emergency surgery, this is pretty rough. Take the R rating seriously. If your church follows the Church Calendar, you may have noticed that today is Trinity Sunday. At Duke Divinity School most students spend their summers serving as interns in North Carolina churches. Each year as summer came around, everyone knew to expect the pastors they worked with to have them preach on Trinity Sunday--because otherwise the pastor would have to! For whatever reason this, the only Sunday of the year dedicated to a particular doctrine, is a notoriously unwelcome event. People don't want to preach on the Trinity (or hear a sermon on it, probably) because it's a complicated and confusing doctrine, and of all the Christian beliefs that could have been chosen, many would argue this is the least practical, the most removed from our daily lives as followers of Jesus. I for one was looking forward to preaching on Trinity Sunday this year, and ever since I realized I would miss that opportunity, I've been determined to discuss the topic here. Why? Well, because the doctrine is complicated and confusing, but it's also arguably the most important article of the Christian faith. And I'm not convinced it's all that impractical, either (more on that next time). So let's talk about the Trinity. In a nutshell, Christians believe in one God who is three Persons: Father, Son, and Holy Spirit. These are not three individuals forming something like a committee or a family, but they are three, each with his own particularities, and all with one nature: God. This three Person God has lived in a mutual and self-giving exchange of love for all of eternity. As one author put it so well, "The Christian vision of God is one that places relationship and love at the most fundamental level of reality." This is the God Christians worship. Theologians over the centuries have worked out precise and complex ways of talking about the triune (a fancy word for "three-in-one") character of our God. But I think the images that Christian thinkers have come up with for understanding something of God's three-ness will be more helpful for us than the intricate theological definitions. One of the most beautiful pictures of the triune life of God that ancient Christians left to us is the picture of the dance. The three Persons of the Trinity live in something like a continual dance with three partners, swinging and twirling one another, weaving in and out of each other, in moves clean and coordinated yet so swift and constant that it can be hard to tell which person is which as they go. The persons are distinct, yet they live a life of motion and interrelation that shows us something other than just one person, a second person, a third person. We start to see the dynamic life of the one God. Of course, every image or analogy for the Trinity will eventually break down. Talking about the Son and the Spirit as the ‘arms’ of God the Father downplays the distinctiveness and full personhood of the Son and the Spirit--they aren't just appendages on some larger being. The beautiful picture of the divine dance captures the personhood of all three clearly and offers a powerful image of the dynamic interactions and harmony in the life of God, but then it fails to illustrate the oneness of God very well. When the dance is over, the dancers will go their separate ways. Take these pictures for what they are worth. But why is it so important that we talk about God this way, as Trinity? What does it matter if we talk about 'God' or 'Father', or just talk about Jesus, or whatever else? Matt Redman (yes, that Matt Redman) captured my feelings pretty well when he said, “it is essential that our worship reflects Trinity, because the one true God we worship is Father, Son, and Holy Spirit.” Our God has revealed himself in three Persons; this is simply the only God we know. And because God has revealed himself to be Father, Son, and Holy Spirit, we really can know a lot about this God. Because Jesus and the Spirit are God, we can actually come to know the eternal God as we read the stories of Christ and the Spirit in the scriptures. Our God does not cast stones, even at those caught in the adulterer's bed (John 8:2-11). Our God is the helper who comes to us when sorrow has filled out hearts (John 16:5-7). It is our God who is the breath of every living thing on the earth (Job 34:14-15). The Son and the Holy Spirit tell us that this is the character of God. That's part of what the doctrine of the Trinity means. The God who can seem so distant is the God who was borne in a mother's womb, who dwells in our bodies now, making our flesh and blood his temples. The God who can destroy body and soul in Hell is the God who dined with the tax collectors and prostitutes. There's no Mr. Hyde, no dark side of God that's totally different from what we see in the life and ministry of Jesus. The doctrine of the Trinity assures us of that. This is who the Christian God is. Maybe there's more to this confession than we give it credit for as we rush and fumble our way through Trinity Sunday every year. Next week we'll be taking a detour away from the topic, but we'll be back on track with "what is the Trinity and why does it matter? pt. 2" in two weeks time.